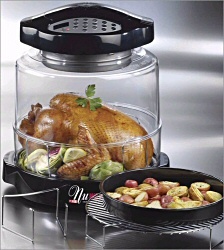 The NuWave Oven is a "must have" item for your kitchen, if you are interested in healthy cooking. Cooking infrared has several benefits over other cooking methods, thus it is my latest product recommendation. We often use traditional pans for cooking, but the NuWave Oven is definitely worth a try. Using this revolutionary oven introduces a new way to cook food. Below, you can read a review about this amazing product. I own one and I love it! Health and longevity really begin with healthy eating. The way you prepare food makes a huge difference in how your body acquires nutrients from it and whether the food is health promoting or not. I wish I could say I never had any problems with this product, but that would not be honest. I have owned three of them. The first two had problems with the fans, which I believe was a design problem that has been corrected. However, the fact that I purchased a third (which is still strong after two years of almost daily use) is a testament to how much I love this product. I simply would not want to be without it because of the convenience it provides. As a single guy who has to cook for himself, I need ways of preparing my food that are "quick and easy," as well as being healthy. Thankfully for me, the NuWave oven does both very well! Buy one, (but be sure to also buy the warranty). Far infrared energy is what comprises about 80% of the sunlight we get outdoors. The human body also produces far infrared energy, so it is a very natural form of radiant heat. This is the radiant energy that the oven makes use of during the cooking process. Cooking infrared with the Nuwave Oven Pro, is a healthier cooking method that either convection or conduction alone, and is a healthy alternative to microwaving heating up foods as well as cooking meals. Please note that "browning" foods is not a healthy practice, and even though the oven can do it, I do not recommend deliberately browning your food. How you cook your food is a personal choice, but do try to strike a balance with cooking times to keep your meal preparation healthy. I wont recommend any product that I don’t believe in, and the this oven is one item I definitely DO believe in! When I need to cook, I like it to be fast, safe, and healthy. After years of using a microwave, I stopped due to the information I read on the hazards of microwaving. I hated to give up the convenience of fast cooking, but the health risks just didn’t seem worth it to me. I searched for another cooking technology that would take the place of my trusty old microwave, and eventually found the Nuwave. This nifty invention does not cook quite as fast as a microwave, but does cook a lot faster than a conventional oven for most foods. It’s quiet, convenient, and healthy. Perhaps best of all, it cooks meat, fish, and foul leaving the food juicy and tender. Just the way I like it! I found cooking infrared to be just what I needed to strike a balance between convenience and health. I use this amazing little oven almost every day and it works flawlessly time after time. I would highly recommend that you check out this innovative new technology of cooking infrared. I think you will agree that the Nuwave Oven is a great solution for quick, convenient, and healthy cooking.